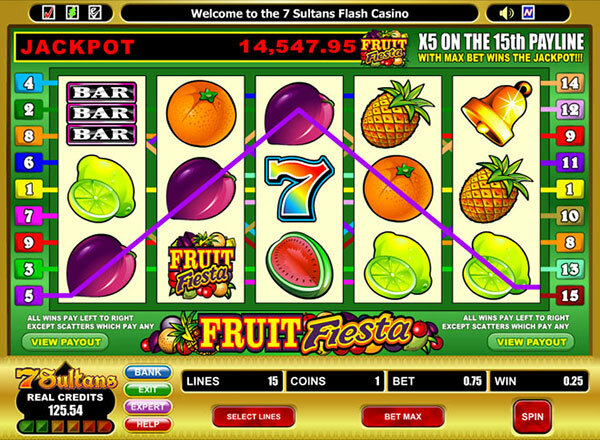 Fruit Fiesta is a throwback to the good old days of online fruit machines. Go banana’s chasing after the gold with this online fruit machine slot game, and discover its secrets with us. Fruit Fiesta is another one of Microgaming’s big winning progressive jackpot slots and it is available in a three reel format. 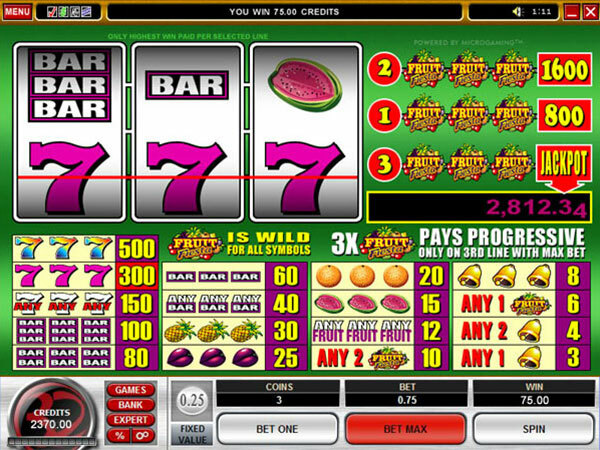 As you might imagine from the title Fruit Fiesta slots is all about the fruit. The fruit covers the reels as icons and this gives off a very old school but ultimately welcome pub fruit machine theme to the online slot game. This three reeled slot is the remarkably colourful and yet original in its design. Despite this, it looks and feels just like a fruit machine, and that is because it is, with one exception. No fruit machine ever had a progressive jackpot quite like this. This three reeled; one pay line Fruit Fiesta slot has a Playtech progressive jackpot of 1,600 coins, or if you’d like to know what that is likely to be in real money, then roughly two and a half grand. That isn’t to say that you can’t pocket more than that though. Up to ninety four thousand dollars has been won before now, and the lowest payout ever recorded was still over the three thousand three hundred dollars mark. There is also a five reeled version of Fruit Fiesta available. By contrast the five reeled version of Fruit Fiesta slots has an improved fifteen pay lines and a progressive jackpot of nine thousand coins. How much is that then? Well oddly enough the jackpot is relatively the same as the three reeled version in regards to how much in real money. Fruit Fiesta 5 reels can be played from as little as 0.05 per spin up to 0.75 per spin, which is still absolutely nothing at all considering you are playing a progressive jackpot slot. The bars, bells, plums, lemons, oranges, apples, cherries, watermelons all make this fruity title even more traditional and the use of scatters and wilds makes it even more entertaining.